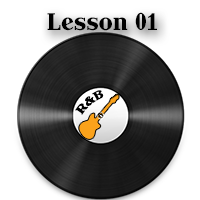 This R&B lesson on fingerstyle guitar is all about being swag. It’s got soul! Just kidding. Well, sort of. But you need to get into a certain, peculiar state of mind. If I would have to describe it with one word, it would be: cool. So yea man, get cool then you can make ’em get down at will. 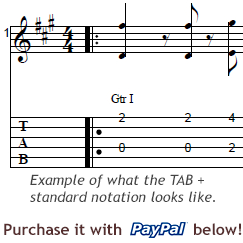 Play with soul, and don’t forget to grab the TAB! Yep. You don’t need to learn lightning speed picking tricks or crazy stretches on the fretboard for this style. The general attitude is a kind of lazy, slightly behind the beat approach. Not quite swing, but the 6/8 time supports this kind of laid back feel real well. The picking hand works in a very similar setup to what you have seen in the African guitar videos I made. The thumb is carrying a rather sparse bass line, mostly root notes (what else, hey?). But besides those plain jane root notes, there are a couple of interesting ghost notes thrown in. These are there to enhance the above mentioned coolness factor. The melody line is played by the rest of the fingers, of course. To create the groove, the picking hand keeps up a constant stream of downstrokes. These are played with the back of the fingers, so the fingernails can give them the right amount of attack. Yeah, the chords are not reinventing the wheel either. Because they don’t have to. You are going to play your usual bar chord grips as a starting point. The pinky of the fretting hand plays a major role again, to fret the melody notes required that are outside the chord tones. In the 2nd part of the tune, the fretting hand shift down into the root position of the neck. This means suddenly a whole lot of easy melody notes become available. Of which the majority you’re not going to use this time. Hehe. Because the life of a guitar player is full of such dirty jokes. Anyway. The notes you do play down there, just fret with the above discussed subdued elegance. If you do so, no one’s gonna get hurt. Speaking of getting hurt, have you downloaded the TAB already? Next → Next post: Creative zone – get into it!